Born in Mantua, she grew up in Imperia, and first became interested in music when taking up Piano studies there. 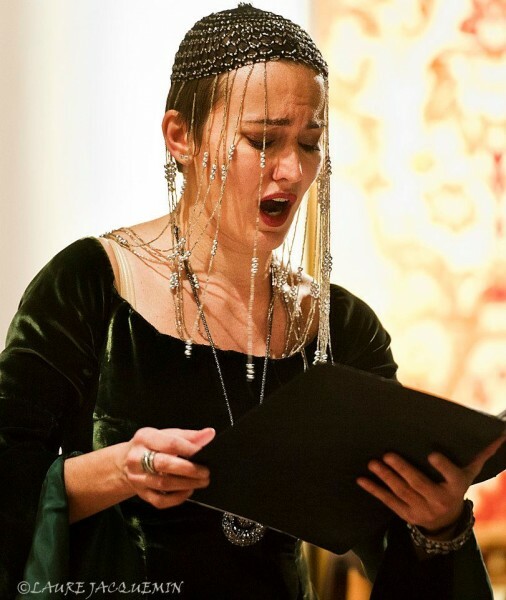 After graduating in Opera singing at the “C.Pollini” Conservatory in Padua, she won several scholarships (the “G.Cini Foundation”, the “G.A.I” [Young Italian Artists], the ”Rotary International Foundation”), and continued her musical training in Switzerland, where she attended an advanced singing course (Fortbildungsstudium “Barok-Klassik”) with Gerd Türk and Evelyn Tubb at the “Schola Cantorum” of Basel, and an advanced singing course (Fortbildungsstudium “Lied und Oratorium”) with Kathrin Graf at the “Hochschule für Musik und Theater” of Zürich. Later she followed a Masterclass held by Mariella Devia in Verona, and had private coachings with Barbara Bonney in Salzburg. Deeply interested in physical theatre, she attended various classes in mime and mask-work with such companies as Larven, Quelli di Grock, Familie Flöz. She also graduated in Modern Literature with full marks with Giulio Cattin at the University of Padua, with a dissertation in music history: “Metaura Torricelli [1866-1893]: the artistic career of a 19th-century virtuosa, documented through articles from the period press”. From 2003 she has performed in many concerts throughout Europe: in Germany (Philharmonie in Köln, Gothare Konzerte and Internationale Händel Festspiele in Göttingen, Staatskapelle and Philharmonie in Berlin, Internationales Kammermusikfestival in Leipzig, Bach Music Festival in Würzburg), in Italy, Switzerland, France, Austria, Spain, Romania, Ireland and Turkey. She has also sang in Israel (Tel-Aviv), Canada (Toronto) and Japan (Tokyo/Kobe). On stage she has appeared as Agnesina in “L’INIMICO DELLE DONNE” by B.Galuppi (Internationale Barocktage Stift in Melk, June 2006), as Ippolita in “ERCOLE SUL TERMODONTE” by A.Vivaldi (Festival dei due Mondi di Spoleto, July 2006), as Alinda, Oronte and Arpago in “L’INCORONAZIONE DI DARIO” by A.Vivaldi (Opéra de Nice, September 2006), as Fortuna, Allegrezza and Venere in “IL GIUSTINO” by G.Legrenzi (Rokokotheater in Schwetzingen, April 2007), as Dirindina in “LA DIRINDINA” by D. Scarlatti (Festival Settembre Musica in Turin, September 2007), as Tullia in “OTTONE IN VILLA” by A.Vivaldi (Teatro Olimpico in Vicenza, June 2008), as Arianna in “IL GIUSTINO” by G.Legrenzi (Grand Théâtre de Luxembourg, November 2008) as Lucio in “IL FINTO TURCO” by N.Piccinni (Teatro Olimpico di Vicenza, June 2009) and as Ramiro in “ARTEMISIA” by F.Cavalli (KunstFestSpiele Herrenhausen in Hannover , June 2010). She has sung under the baton of several renowned conductors (including Rinaldo Alessandrini, Gustav Leonhardt, Philippe Herreweghe, Claudio Scimone, Bob Van Asperen, Alan Curtis, Giovanni Sollima,Thomas Hengelbrock, Ingo Metzmacher, Mario Brunello, Stefano Montanari, Frieder Bernius) and collaborates with various period-instrument ensembles and orchestras (La Risonanza, Accademia Bizantina, La Venexiana, Harmonices Mundi Bozen Baroque Orchestra, L’Arte dell’Arco, Venice Baroque Orchestra, Concerto Italiano). She has recorded for the following Labels: Glossa, Dynamic, Brilliant, Cpo and Warner Chappell Music.